Former Australian captain Michael Clarke has come out publically that Australia will not be successful with the new culture that Cricket Australia is trying to create after the banning of current captain Steve Smith and David Warner following the ball-tampering incident at Newlands. Clarke has stated that they will “Win sh—t” with the new culture and that their aim is to be liked but not respected. He wants to continue with the verbal (and at times bordering on physical) abuse and arrogance of the past. 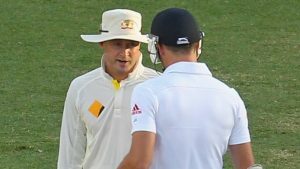 He has endorsed the old culture of the Australian team and sees nothing wrong with the bully tactics of years gone by. This is disappointing for a respected and successful Australian captain who has a head in the sand approach. If Clarke thinks that world cricket is going to tolerate an out of control Australian team, he is out of touch with reality. World cricket will no longer tolerate the cricket atrocities of the past committed by the likes of Shane Warne, Merv Hughes, Glenn McGrath and Warner, to name but a few. One thing is for sure that Newlands was a watershed moment for Australian cricket and they will have to mend their ways. Cricket Australia took notice of this and to their credit is trying to improve the behaviour and credibility of their national team by creating a new culture. The game of cricket is not an island, nor is Australian cricket, and the game needs to appeal to communities around the world by having a good image and credibility. The win at all costs culture that Australia has adopted and being promoted by Clarke has damaged the game. Historically Australian cricket has been the flagship of international cricket and aspirational for other cricketing playing countries. They have produced many great cricketers who have graced the game and achieved so much success in Test cricket and ICC World Cups that they do not need to adopt these gutter tactics of win at all costs. They need to return to their glory years of fair play and once again become the respected leaders in world cricket. No one expects them to become soft but to play hard, as they are known for, with sportsmanship and respect for other countries and cricketers.